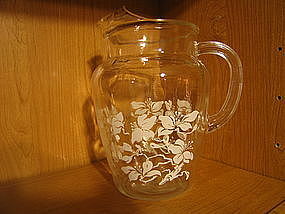 Vintage ice tea pitcher. Most likely manufactured by Anchor Hocking. It holds approximately 80 ounces and measures 9 inches in height. There are several usage marks to the surface, as well as wear to the gold Greek key design that encircles the pitcher. I need your zip code to calculate the postage.